The Forcefield Security Screens, doors and windows by Prowler Proof offer a clean design alternative and Goldfields Screens and Blinds are happy to be the authorised dealer for Victoria. If you want fresh air, security and flyscreen protection with uninterrupted views, the Forcefield Security range is a great alternative. 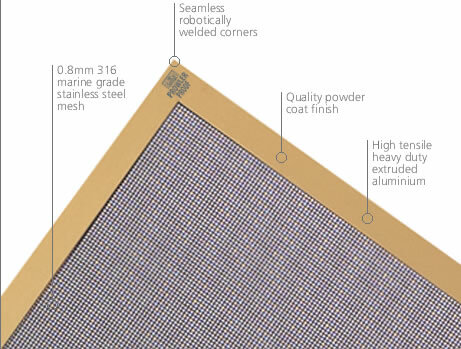 Twenty-times stronger than your average security product, Forcefield Security screens use 0.8mm marine grade stainless steel mesh linked using a synthetic compound into an extra heavy duty frame. Talk to Goldfields Screens and Blinds about your preference and budget for security screens and we can advise you on the most suitable option.